At last my PhD research project is taking shape. In the course of many jobs, far beyond the data visualisation (datavis)* industry, many people are having to make sense of charts and graphs and maps. You don’t have to look far to find examples of datavis being used for reporting, monitoring, competing for funding or campaigning. But those people coming across them may or may not have the know-how* to make sense of them. Or the resources to get that know-how. 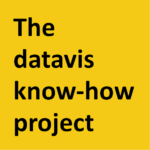 My research project aims to understand what datavis know-how looks like in the workplace. It also aims to make sure that everyone who takes part benefits from their involvement. In this case that will be through acquiring some datavis know-how. And this matters, for social good*, because our world is increasingly driven by data*. So, it is those who can make sense of datavis who get to shape today’s world. * Find out what I mean with these terms, and follow how my research project is developing, at The data visualisation know-how project.